Clathrin-mediated endoycytosis (CME) is triggered by the binding of the virion to host receptors . The virion attachment to the host receptor induces the binding of an adaptor protein to the receptor cytoplasmic tail. Adaptor proteins bind to clathrin(X55878:9606), and the local concentration of adaptor proteins on the inside face of the plasma membrane allows clathrin to multimerize to form characteristic invaginations or Clathrin-Coated Pit (CCP). Membrane scission proteins DNM1/Dynamin-1(L07807:9606) or DNM2/Dynamin-2(L36983:9606) pinch off the CCP from the host membrane thereby releasing the Clathrin-Coated Vesicle (CCV). The clathrin(X55878:9606) basket is subsequently released from the vesicle by auxilin(AB007942:9606) and hsc70(Y00371:9606). 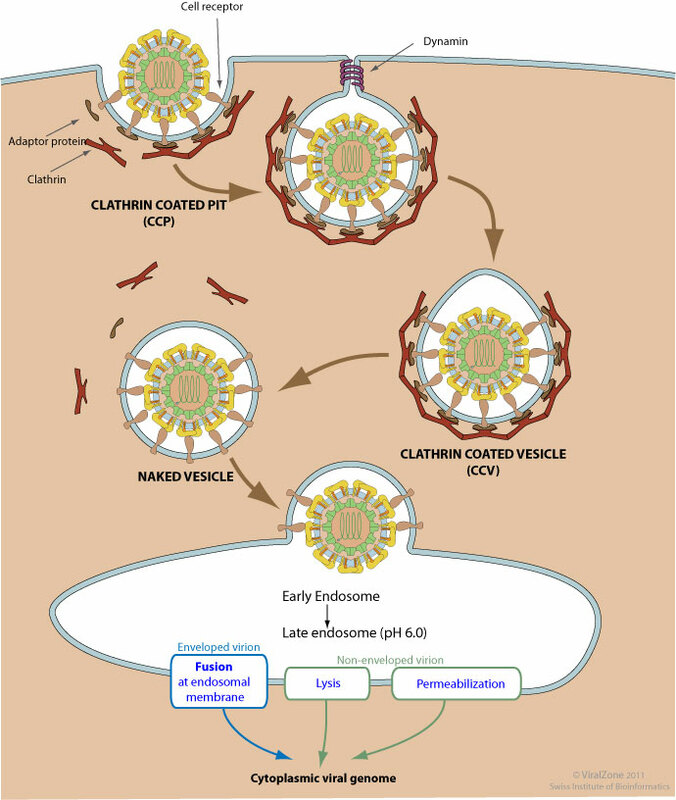 The vesicle then delivers its viral content to early endosomes. Endosomal acidic pH and /or receptor binding usually induces structural modifications of the virus surface proteins that leads to genome penetration into the cytoplasm via fusion or permeabilization mechanisms.